Fibrin, the coagulation end product, consolidates the platelet plug at sites of vascular injury and supports the recruitment of circulating platelets. In addition to integrin alphaIIbbeta3, another as-yet-unidentified receptor is thought to mediate platelet interaction with fibrin. Platelet glycoprotein VI (GPVI) interacts with collagen and several other adhesive macromolecules. We evaluated the hypothesis that GPVI could be a functional platelet receptor for fibrin. Calibrated thrombin assays using platelet-rich plasma (PRP) showed that tissue factor-triggered thrombin generation was impaired in GPVI-deficient patients and reduced by the anti-GPVI Fab 9O12. Assays on reconstituted PRP and PRP from fibrinogen-deficient patients revealed a fibrinogen-dependent enhancement of thrombin generation, which relied on functional GPVI. The effect of GPVI was found to depend on fibrin polymerization. A binding assay showed a specific interaction between GPVI-Fc and fibrin, inhibited by the Fab 9O12. This Fab also reduced platelet adhesion to fibrin at low (300 s(-1)) and high (1500 s(-1)) wall shear rates. Platelets adherent to fibrin displayed shape change, exposure of procoagulant phospholipids, and the formation of small clots. When hirudinated blood was perfused at 1500 s(-1) over preformed fibrin-rich clots, the Fab 9O12 decreased the recruitment of platelets by up to 85%. 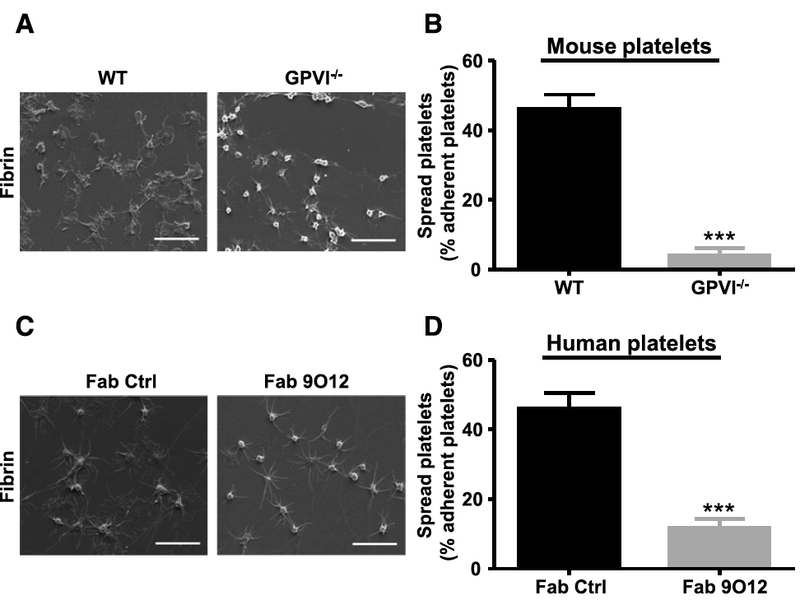 This study identifies GPVI as a platelet receptor for polymerized fibrin with 2 major functions: (1) amplification of thrombin generation and (2) recruitment of circulating platelets to clots. These so-far-unrecognized properties of GPVI confer on it a key role in thrombus growth and stabilization.